This should be prayer for devout Hindus who pray Sri Subrahmanya! Kandhar Anubhuti is truly one of the BEST works in Tamil Literature. I was blessed enough to learn this when I was in US in early 2000s from Meena gave me a cassette with recording of Sri TKS (who was no more then) and I used to listen this continuously till I memorized it. If there is ONE work that alone is enough to take a person to liberation, give health, wealth and in the end give final Union (Anubhuti) the Supreme Lord, it is Kandhar Anubhuti. Lord Subrahmanya is always with Meena, Sankar and family for they are some of the most beautiful souls who come to share joy and peace in this world. I am so happy Meena is uploading Periappa's (Shri TKS') Thiruppugazh renderings. This page needs to be bookmarked, subscribed to, and regularly consumed by all devotees of the Lord. Sahana (Sankar / Meena's second daughter) was about year old then, and once was crying when I was in their California residence. Meena carried her and sang something very beautiful. Sahana stopped crying! After Meena put Sahana back in the cradle, we walked away, and I asked Meena what that song was - My knowledge of scriptures was (is) severely lacking. Meena said it was Kandhar Anubhuti. I requested her to teach that to me, and she did. She also gave me the cassette with the recording of this by Sri TKS. After Meena gave me the cassette, I listened to the song in a Sony Walkman (ha ha ha - Remember those?) continuously for a couple of weeks till I memorized the 51 stanzas. From then on, the song is quite famous at least with people with new born kids who cry :-) It has a magical effect of controlling kids who tend to turn quiet and sleep esp if they are cranky. That's my story of learning Kandhar Anubhuti, and is one of the best things to happen to me. Contradictory to popular opinion, my Sanskrit knowledge is abysmal. I somehow manage to figure out the meanings of verses / songs with great difficulty after consulting many sources. Sometimes, I feel I shouldn't write much because, I have no intent of misleading anyone. The word Aprameya is also a name of Vishnu in mentioned in Vishnu Sahasranamam. Needless to say, at the Highest Level, there is no differentiation. The question comes, how is anything revealed? One can say by 'senses' - For e.g., you can see something, hear something, touch something etc. For eg., in TN you can still hear people say 'Pratyakshama paathen!' - Which is 'I witnessed it with my own eyes' - Prati in Sanskrit meaning 'Via' or 'Using' and Aksham meaning 'Eye' - So together it become Pratyaksham. Now we can see that there are three types of Pramanams - Pratyaksha, Anumana and Shruti Pramanam - Three ways of 'Revealing'. The funny thing is that I know this for a very long time. Now came the twist - If pramanam is the word for the 'way of the revealing', what is the meaning for the one that is revealed? It is 'prameya'! 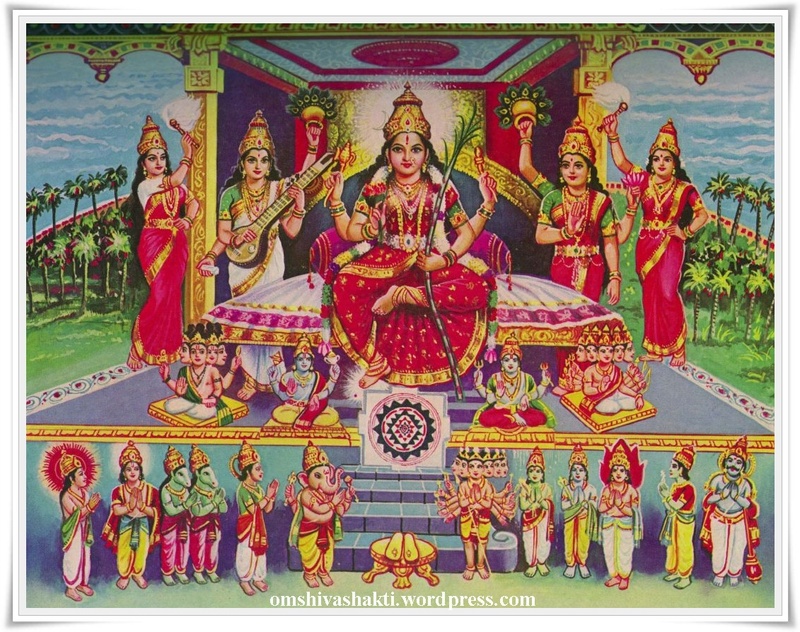 I then realized that why is Ambal, the Greatest One, The Supreme Goddess called 'Aprameya'? Because, EVEN Vedas, cannot reveal Her! There is nothing known by humans, Rishis, Gods that can reveal Her. She is the PERFECT HIDDEN ONE. Words, Metaphors, Logic, Vedas expose their weakness and shy in front of the Glory of the Goddess, Sri Lalitha Maha Tripura Sundari! The next name is 'Sva Prakasha' - One Who Reveals / Shines Herself (of Her own volition) - So, when Ambal is pleased, She will reveal Herself. This name is even more dear to me, and I'll save you from my ramblings on this name. (It can be reflected upon in many many ways). So, next time you listen / chant Sahasranama, and you get to this Name, bow to Her in all Humility that She is the One beyond all realms and let the ego get squashed. Pray to Her fervently when you get to the next Name for Her to Reveal Herself.